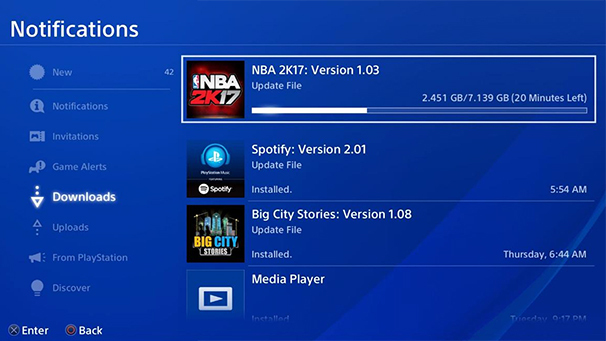 2K Sports has just released the latest NBA 2K17 patch on PlayStation 4, which includes a whole bunch of bug fixes, gameplay adjustments, tweaks and improvements. The patch weighs in at 7.1 GB. You can find the complete patch notes below. While the PS4 version of NBA 2K17 has already seen the newest update, Xbox One players have to wait a little bit longer. That’s, unfortunately, just a part of Microsoft's process for console patches, which have to go through a much more comprehensive certification process before eventually hitting the platform. As for PC users, there's a patch in the works as well to bring it up to par with the console version; there is no ETA yet, but I'd guess it'll be available shortly after the release on XB1. Once earned, Grand Badges should now properly appear on your player in Pro-Am & MyPARK games. Many other small bug fixes and adjustments were also made, game-wide. According to 2K, the patch fixes will work in your existing game mode saves. The update will download automatically as long as you're connected to the Internet. We will notify you as soon as the patch arrives on Xbox One and PC platform. UPDATE: Patch 1.03 has arrived for Xbox One and PC players. What fixes or adjustments would you like to see in the next NBA 2K17 patch? Where do you think the game needs the most work? Leave it in the comments, and maybe some people at 2K will address it.